Color reversal film stock now back on the open market! 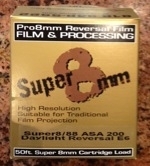 Super 8/88 is a 200 ASA notched stock and includes pre-paid E-6 same day processing. It can be traditionally projected on a film projector or digitally scanned.